Anglers swear by a spinning reel. The reel consists of a gear compartment, a bail, an open spool and a handle that can be reversed for a left handed or a right handed fisherman. It also allows a fisherman to go casting, still fishing or even trolling. The best line that goes with this particular reel type is a monofilament line. But in order to make the full use of the reel, one has to be aware of how to use it. If you want to know what the successful anglers do, then read on. The first thing you need to do is open the bail on the reel and pull the line up through all the guides. Now turn the handle either clockwise or counter clockwise, this helps to snap the bail back over. Take a hook or a lure and tie it onto the end of the line. One thing you must always remember about spinning reels is that you always hold it in a way so that the reel is hanging down. 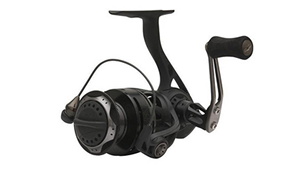 Now while you are holding it down, notice if the stem that connects the reel to the base is between the second and third fingers while your hand is gripped around the rod handle. Keep turning the spool gently and carefully until the line coming out from the under the bail is at the top closest to the rod. With the help of your index finger, hook the line and lift is towards the rod. With your other hand, open the bail. Now bring the rod back and forward to cast. Right about this time, straighten the index finger holding the line so that it peels off the reel. Snap the bail shut after turning the reel handle forward. To retrieve the line, turn the fishing reel handle counter clockwise, which turns the bail that winds the line back on the spool. For still fishing, cast bait out or cast lures and retrieve them by same casting sequence. A few things must be kept in mind- the line must come out from under the bail or it won't wound back onto the spool. These spinning reels come in a wide range of sizes for various fishing styles and conditions. These reels must always be mounted on a spinning rod that has a large bottom rod guide and larger guides the length of the rod. At the same time, a spinning reel must be matched with a proper weight rod. The rod and reel set up will not function properly if they are not matched. You might find all this a little complicated but as you start handling the rod, you will get a hang of it and see hoe easy it is! But no matter what make sure you get all your fishing tackles from some reputed brand like this. You don't want to ruin your fishing trip. To ensure that your tackles work well, it is important to take proper care of them, maintain them. You also need to use an ultra light reel with ultra light rod, a mid size reel with a light or medium weight rod and salmon size reel with a large salmon rod. Good Luck and Tight Lines! Allan Simons is a n avid outdoorsman from Australia. He also has several fantastic outdoor articles to his credit wherein he shares his kniwledge and expertise.